Cousin Itt? Nah, just onion seedlings. I went a little crazy with the onions this year. I’m told that onion seeds lose a large percentage of viability after the first year so I gathered up all of my old (and new seeds) and planted them. They all germinated! Now the challenge is to figure out where to put them all when spring planting time comes. I believe that all great meals start with something from the allium genus. Good for companion planting with cabbages and in helping to deter rabbits, onions are a must in any garden. Here’s a little preview of what we’re growing this year at Pinkguitarfarm. Scotland Leeks – an heirloom variety from Scotland this leek is described as “hardy, short-shanked, (with) excellent flavor and texture.” Seeds of Change. I bought this because it is a good variety to overwinter or keep in the greenhouse. I immediately envision a creamy potato leek soup when I see the picture on the package. However, this spring I’ll be indulging in some roasted baby leeks with an herb marinade and baby leeks with fennel braised in cream, hmmm, I wonder if they will all make it to winter. Shimonita Negi – Japanese Bunching Onion Single Stalk Type. From the packet: “(365 days) King of the Negi, this single stalk Japanese bunching onion is worth the wait in seed to harvest time. It doesn’t get better than this for flavor which only gets sweeter with cooking! The short and fat white root makes the Shimonita Negi look more like a leek than a scallion. The chunky shape means this variety does not need deep soil mulching and a lot of extra work around harvest time. From the sowing to harvest (typically December)this is a one-year crop….The Shimonita Negi is popular throughout Japan, but particularly so in its place of origin, Shimonita Town, famous for its produce. Tourists are advised not to miss a particular Shimonita rest stop where the onions are sold during their season.” Kitazawa Seed Co. I’m a sucker for this kind of marketing, what can I say? Hope it’s worth an entire year of raised-bed real estate! Mini Purplette Bunching Onion. From the packet: “The first purple red-skinned mini onion. Early maturing with delicate, mild flavor. Attractive either topped or bunched and can be harvested very young as baby bunching onions with purple pearl ends. Turns pastel pink when cooked or pickled”. Seeds of Change. Mmmm pickled! Garlic chives. From the packet: “Heirloom, medicinal…Popular in 16th century European gardens for adding garlicky flavor to soups and salads. Hung inside homes to ward off malevolent spirits. Green seeds impart rich flavor to cooking oils. Leaves and flowers add spice. Also used in Chinese medicine to warm the kidneys and treat lower back and knee pain”. Seeds of Change. This one is indispensable for the garden, kitchen, household and body! Don’t you love the word “garlicky”? Red Beard – Japanese Red Bunching Onion Splitting Type. From the packet: “This popular specialty red-stalked bunching onion has a mild pungent flavor and tender leaves…The red color is stimulated by cold temperatures. Mature plants can reach 26” tall. Used in stir-fries, salads and as a garnish. Red Beard makes an unusual and attractive addition to the garden”. Kitazawa Seed Co. Hmm. Wonder if it will be a big seller at the local farmers market, I may have to bring some recipes with this one. Can’t wait to see how it looks at maturity. Texas Early Grano. From the web-site: “Texas heirloom, ‘The Mother of All Sweet Onions’ This Vidalia-type onion is a good choice for the Mid-Atlantic and the South. Best started in the fall or winter and transplanted in early spring. Large top-shaped bulbs, thin skin, soft white flesh, with sweet mild flavor. Good resistance to splitting. Short keeper”. Southern Exposure Seed Exchange. Sweet onions are my fave, French onion soup anyone? Japanese Bunching Onion Splitting Type – Menegi. From the packet: “This delicate white green onion is a young shoot of the wakegi scallion. Specially cultivated to produce young shoots that are used as a sashimi and sushi garnish. Menegi are harvested very soon after planting when the scallion has grown to a height of only 3”-4”. Because they are harvested when they are young and thin, Menegi need heavy planting”. Got the garnish, need the sashimi! Oishii desu ne! More Scotland Leeks, see description above. Cipolla/Long of Florence. From web-site: “Long (4 inch) narrow red onion. Wider in middle than the ends. Mild sweet taste. Beautiful. Medium/long day type. Mid season harvest. Use in salads but stunning grilled or on skewers”. GrowItalian.com I LOVE, love, love ALL my Franchi seeds! More Cipolla/Long of Florence, see directly above. More Texas Early Grano, see above. Bunching, Deep purple. From the web-site: “A new development in bunching onions. This reddish-purple variety develops and retains its color throughout its growth period and through high and low temperatures”. Southern Exposure Seed Exchange. I like purple. Here’s to a great year of onions! Onions are easy to start and grow. 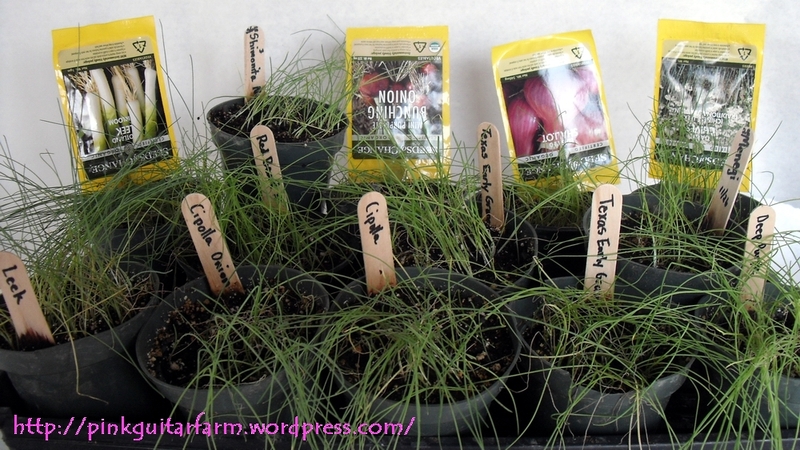 From quickie chives to large bulbs there are enough varieties to keep you in onions year round in your own garden, so people, please start your onions!